Aweber email marketing software review. Today we are back with a new Email Marketing software review which is based on a question – What is Aweber Email Marketing Software? Well, you must all know about AWeber. I was getting many emails from our readers about AWeber. So in this post, we will explain you all about AWeber, it’s price for different plans for each month, Comparison, Features etc So, you must be aware of email marketing software. Since the inception of the era of digitalization, email has acquired an important place in everyone’s life; especially in corporate life. It is to be, said that more than 35% of people in this world use email which is calculated to be 37% by the end of next two years. Also, every day almost 196 billion emails get exchanged among which 109 billion emails are related to business. So, in a nutshell, email is a big part of our everyday life, whether it is for business purpose or casual. In today’s world, you cannot find a single person who does not acquire an email account. When such a big percentage of world population use email regularly, it does have an important effect on marketing too i.e. email marketing. As emailing is the easiest way to connect people, it is the easiest way to choose customers for any business too. So, it does not matter how people are active on social, Medias; email marketing still leads the way. And as an entrepreneur, it must be difficult to customize every email and send it to customers. Here comes the validity of email marketing software. With the help of email marketing software, anyone can easily customize emails and send it to a targeted audience without spending much time. From listing email subscribers to customizing email templates, email marketing software will be through everything related to email marketing. And if you are in search of such email marketing software, we might have the best solution for you– Aweber Email Marketing Software. Although Aweber is old email marketing software, it is still competing with many new horses in the race. The new updated 2017 form of Aweber email marketing software is promising, and it works great as newsletter software as well. Let us have a look. 1 What is Aweber Email Marketing Software? 2 How much does Aweber cost? What is Aweber Email Marketing Software? Aweber is nothing but an email marketing software that is a Pennsylvania based company. Apart from offering Email marketing, it offers different prospects of email marketing as well such as autoresponder, RSS to email etc. which helps an entrepreneur to send out emails to every subscriber in a particular pattern or frequently. Also, it delivers any blog post or content of any website in such a way that it will compel the readers to read your blogs. Created by Tom Kulzer in 1998, Aweber Email Marketing software is quite an old email marketing software, but it is still the best and the easiest to operate in the market. The new Aweber 2017 updated form is extremely popular and helpful as a newsletter software and email newsletter software. Not only does it deliver the best email marketing service but it also fits for every kind of HTML email marketing process. When the number of subscribers is 500 or less than 500– $19 per month. from 501 to 2500 subscribers– $29 per month. from 2501 to 5000 subscribers– $49 per month. from 5001 to 10,000 subscribers– $69 per month. from 10,001 to 25,000 subscribers– $149 per month. More than 25,000 subscribers– Aweber special quotation price. Comparing to the service provided the Aweber pricing system is much less than any other email marketing software. However, every time is not the case. Here we will compare Aweber with other six most popular email marketing software in the market– Campaign Monitor, iContact, MailChimp, GetResponse, Mad Mimi. Aweber is much cheaper than Campaign Monitor and iContact. It is almost as same as the MailChimp. And Aweber is comparatively more expensive than the GetResponse and Mad Mimi. However, this general comparison may not always justify as the perfect comparison because some of the above software is better for small list of subscribers while the rest fall into the category of higher subscribers and Aweber falls into the latter category i.e. Aweber is not great to use when you have a small list but it is much cheaper to use when you have a bigger list of subscribers. The featuring list of Aweber is vast like an ocean. The features of the Aweber answer the question why it is better advised to use Aweber. Let us have a look. If you want to import existing data into Aweber software, it is a simple process. You can import XLS, XLSX, TSV, CSV, TXT kind of data into Aweber without any kind of complications. Also, according to your rate of importing data, you can also manually set the list of subscribers too. Comparing to any other software available in the market, Aweber provides the largest set of e-newsletter templates– currently, 700 are available on Aweber. Comparing to Aweber, other software has way fewer templates than Aweber. Another good thing of Aweber is autoresponder. With the help of easy autoresponder system of Aweber, you can easily list out different subscribers for different emails and newsletter. They invented the system of autoresponders back in 1999, and thus it works perfectly and efficiently. Aweber’s email designing is responsive thus it can easily be resized based on the device the customer viewing the email on. For the new digitalization era, this feature is an absolute necessity. Split testing or A/B testing is a process where you sent variants of your e-newsletter to some of your mailing lists and based on that, you can choose the best version for the final outcome. Aweber can provide you with four variants of an email and the split testing system works efficiently in Aweber. Reporting or largely known as ‘email analytics’ of Aweber is pretty good. With the help of Aweber, you can get reports of various subjects such as– the growth of list, sign-up method overview, the history of any individual’s activity, geographical location of the viewer, etc. Aweber provides you with an RSS to email system where your site’s RSS feed will automatically turn into e-newsletters, and it sent out immediately, depending on the schedule. It is helpful for bloggers who want their subscribers to get a newsletter as soon as they post any blog. In Aweber, you can easily create segments, not only depend on your contents but on your activities too. The segment data option of Aweber is very easy to use and not at all complicated. 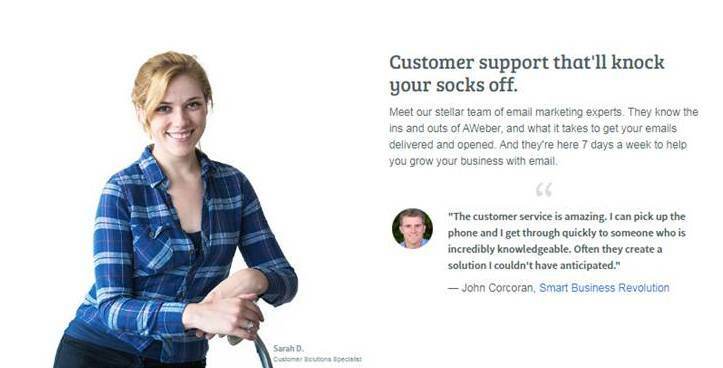 The Aweber support system is one of the most efficient systems among many other competitors. Phone support, email support, live chat support–Aweber is perfectly flexible with all these options. Apart from these important features, there are many other features of Aweber as well such as App showcase, Drag and Drop Editor System, Aweber mobile app, Bulk email marketing, Bunk email marketing, permission email marketing, direct email marketing, etc. Despite having the long list of features, Aweber has a list of pros and cons separately. Easy to use, not complicated. It has efficient third-party tools and apps. It has great import system. A good system of split testing. 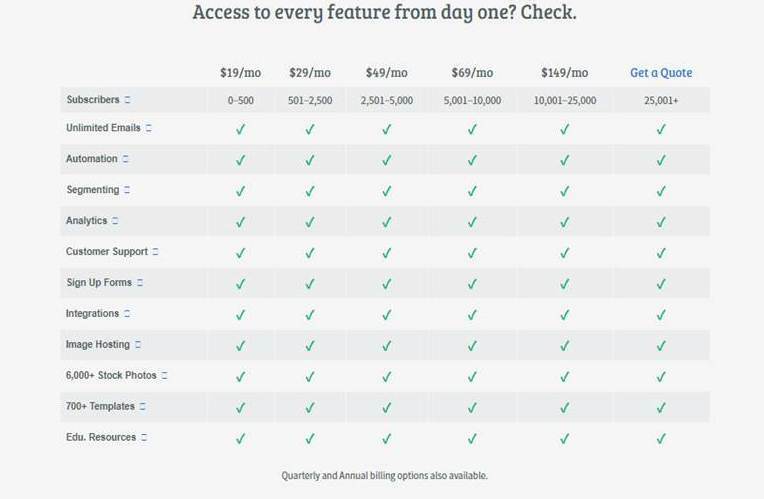 Aweber is expensive when you have a small list of subscribers. The RSS to email does not work all the time properly. Some of the templates are little back-dated. Aweber Email Marketing software provides you with a free trial for 30 days. This is all about AWeber email marketing software review. Apart from all those pros and cons, Aweber is one of the oldest email marketing software on the market, and it is still running as one of the best. So, Aweber is an obvious choice when you are going to a long list of email subscribers. Happy Emailing!